As you may know, Sherlock is currently in limbo. Due to the ridiculously successful careers of its two stars Benedict Cumberbatch and Martin Freeman, it is currently unknown if the BBC show will ever get a fifth series. Given that, you might think that the production team had at least once considered recasting the lead roles and continuing. Well, apparently not. “That doesn’t mean that there won’t be other Sherlock Holmes – there are already other Sherlocks and other Watsons out there – but this version of Sherlock Holmes is those two actors, it absolutely is. And I know that because I saw it[…] the very first time that Martin and Benedict played those parts together in the audition room. Is there anyone out there who actually would like to see Cumberbatch or Freeman recast? Don’t be shy – let us know in the comments! Let us not be silly. It has to be Cumberbatch &a Freeman! 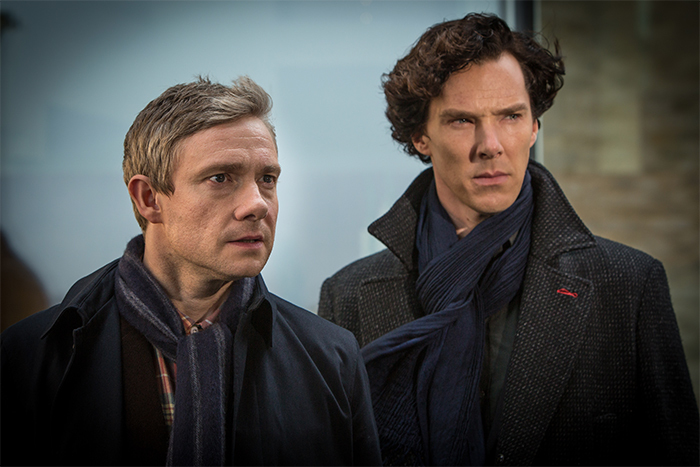 Benedict & Martin – no one else can replace them together !! Hell NO! I wouldn’t watch it. The show made me a fan of those two for life. I just hope and pray they can find the time to keep doing it. Just each year dedicate 4 months or whatever it takes to film 3 episodes. Better 3 than none at all. It’s my favorite show if all time. I want to see them and not anyone else in those roles. But, they really should make time to film some more episodes of Sherlock for all of their fans.